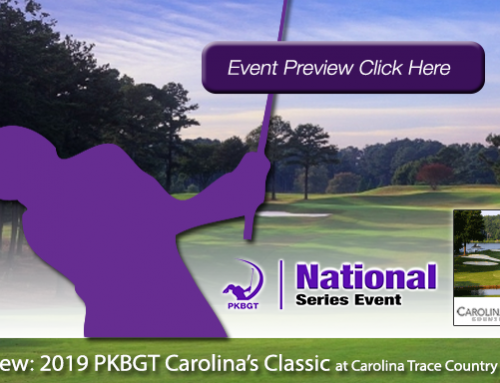 On Sunday, April 7, the Peggy Kirk Bell Girls’ Golf Tour played the final round of the 2019 PKBGT Masters presented by Aunt Ruby’s Peanuts at Greenville Country Club in Greenville, NC. Shadows of players lined up at the driving range pushed through thick Sunday morning fog in preparation for the final round of the 2019 PKBGT Masters. With 18 holes left to make a push, ironing out the kinks from Saturday’s first round was the main priority. Mother Nature was not a friend to the PKBGT for the second day in a row, swapping pesky rain showers for a fog strong enough to delay the start by half an hour. For the Bell National players set to tee off in the later slate of starting times, the delay allowed for extra time to sleep in, get ready, eat a full breakfast and mentally prepare for the final round. 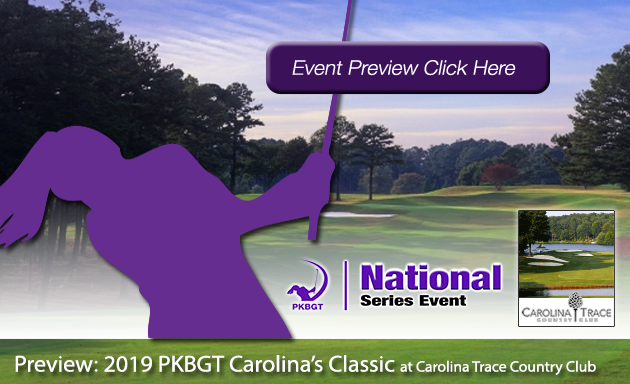 The Prep Preview and Futures National field arriving bright and early to Greenville Country Club used the extra time to focus on the final adjustments to their approach in the final round. Slowly but surely the sun pushed through the fog, opening up visibility and commencing the final round of play. For the second day in a row, players were greeted by the smiling faces of the East Carolina University Women’s Golf team at the starting tent and scoring tents. Members of the Lady Pirates’, both PKBGT alumni and not, volunteered to help the final day of the event run smoothly at their home course. By the middle of the round, the fog disappeared into the bright and vibrant sunny blue skies that graced the course for the remainder of the tournament. On the course, the leaders pulled away in two of the three divisions while it was a dogfight in the Futures National division. The clear conditions helped several players step their game up, bursting into the Top Five. 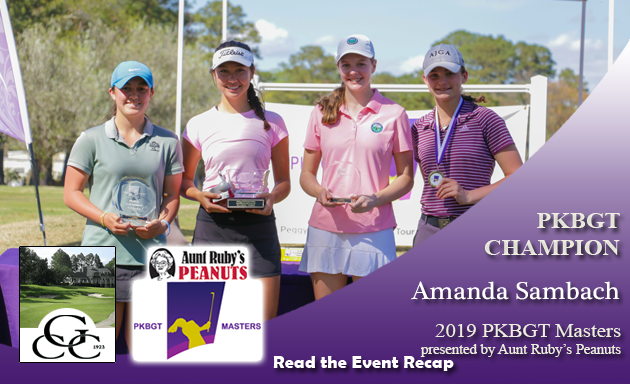 At the end of the day, three players stood atop the field as champions of the 2019 PKBGT Masters presented by Aunt Ruby’s Peanuts! 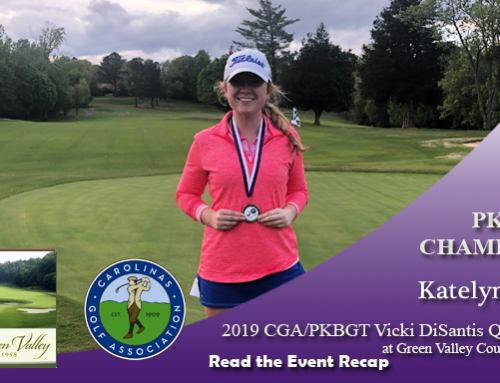 We take a look at how everything panned out at Greenville Country Club on Sunday! 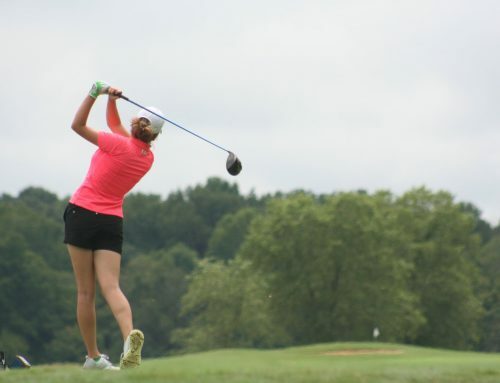 A golf tournament was certainly had by Amanda Sambach (Davidson, NC 2021) who followed up her first day’s performance with yet another round under-par. Sambach, who posted a tournament total score of 67, 67, 71 = 205 (-11), lit up the scorecard on Sunday. She was even-keeled on the front nine before a triple bogey tripped her up on the back. Sambach responded with an eagle followed by a birdie and closed out her round with one last birdie to go under-par for the day. 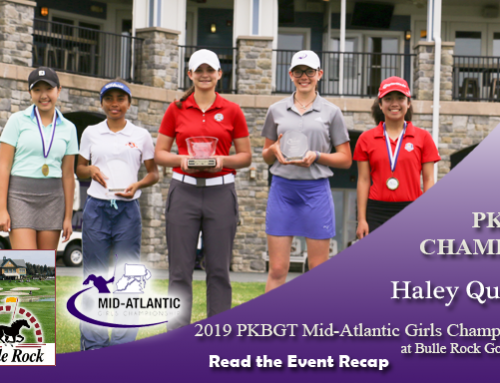 In her stellar performance, Sambach took home the 2019 PKBGT Masters championship in the 35 player Bell National field. Sambach wasn’t the only player in the red on Sunday. 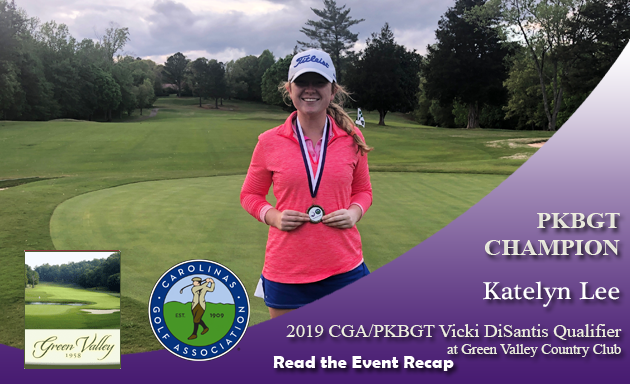 Kendall Turner (Chesapeake, VA 2019) shot the final-round low score of 69 (-3), with two birdies and an eagle pushing her into second place for the tournament. Turner closed out the weekend with a tournament total score of 81, 73, 69 = 223 (+7). Continuing her steady play from Day One, Adrian Anderson (Murrells Inlet, SC 2022) shot her lowest score of the tournament on Sunday and took sole possession of third place. Anderson’s tournament total score was 77, 77, 76 = 230 (+14). Her final-round 76 came with a birdie on the sixth hole, the best of her day. 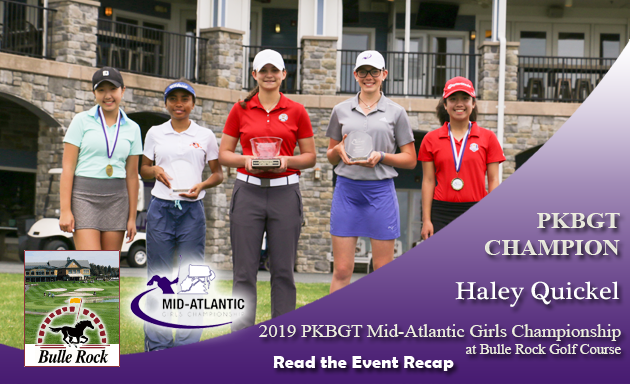 Haley Quickel’s (Middletown, DE 2020) long journey south was worthwhile as she heads back north with a Top Five finish under her belt. Quickel’s tournament total score of 82, 75, 75 = 232 (+16) was good enough for fourth place in the tournament. Much like Quickel, Meher Mankikar (Bridgewater, NJ 2020) made sure her trip was beneficial, rounding out the Top Five and taking home fifth place. Her three-day tournament total was 77, 79, 77 = 233 (+17). Closing out the tournament with ice water in her veins, Sydney Hackett (Ashburn, VA 2022) shot two birdies on the final three holes of play to take home the championship in the 23 player Bell National field. Hackett’s two-day total score was 78, 74 = 152 (+8) and her final round came with three birdies. 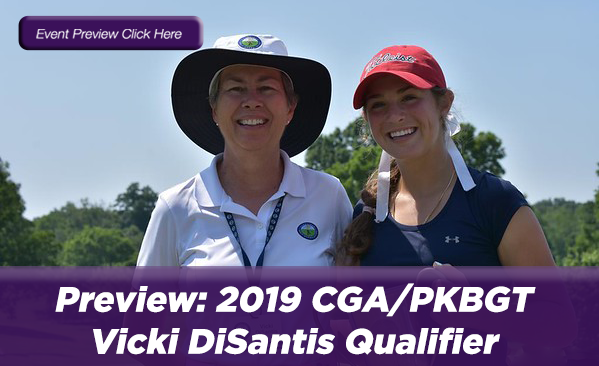 Finishing runner-up at the 2019 PKBGT Masters, Megan Morris (Cary, NC 2021) was on fire early in her final round. She made three birdies in a row en route to a two-over front nine. Though she hit a few bumps in the road on her back nine, Morris’ two-day total score of 77, 80 = 157 (+13) was good for second place. One stroke behind Morris, back-to-back 79’s for a two-day total score of 158 (+14) gave Abby Franks (Roebuck, SC 2023) third place in Greenville. Franks’ best hole of the day came via a birdie at the fifth hole. Elizabeth Ritchie (Morehead City, NC 2019) finished in fourth place with a two-day total score of 82, 77 = 159 (+15). Rounding out the Top Five in a three-way tie for fifth place was Macy Pate (Boone, NC 2024), Christina Cupelli (Fairfax, VA 2021) and Amber Mackiewicz (Virginia Beach, VA 2023). Pate’s two-day score was 86, 76, Mackiewicz’s was 83, 79 and Cupelli’s was 82, 80. All three players finished with total scores of 162 (+18). 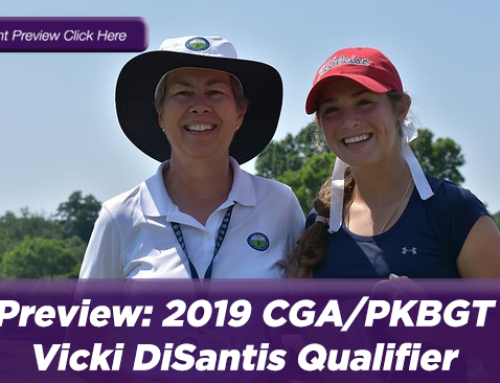 At the top of the leaderboard for the second time this season, Sophie Lauture (Raleigh, NC 2024) took the 2019 PKBGT Masters championship in the 24 player Futures National division. Lauture’s two-day total score of 82, 77 = 159 (+15) came with two birdies in her final round. She sank a birdie on her second last hole of the day to secure the one-stroke victory. Finishing runner-up with a two-day total score of 80, 80 = 160 (+16) was Grace Ridenour (Cary, NC 2025). Ridenour earned her second Top Two finish in as many weeks in Greenville and gave Lauture a run for her money on the final day. In third place was Josephine Nguyen (Springfield, VA 2023) who shot a two-day total score of 79, 84 = 163 (+19). Nguyen faced adversity on the second day of play, but her first-round performance gave her the cushion to remain in the Top Five. McKayla Daffin (Fayetteville, NC 2021) earned a fourth place finish after a two-day total performance of 87, 79 = 166 (+22). Rounding out the Top Five in a two-way tie for fifth place was Grace Addison (Abingdon, VA 2023) and Emerson Dever (Durham, NC 2025) with two-day total scores of 169 (+25). We would like to extend our greatest thanks to the entire staff of Greenville Country Club for their incredible hospitality over the entire weekend. We would also like to thank our event partner, Aunt Ruby’s Peanuts, as well as the Optimist International Club of North Carolina East for providing lunch on Saturday. Congratulations to all of our Top Finishers at the 2019 PKBGT Masters!